Conditions on the 7th and 8th December were indicative of a widespread outbreak with supercells anticipated. With good directional wind shear and a dryline setup, one could not rule out a few tornadoes. These were the best conditions I had observed in Australia on models and lasting for more than one consecutive day! 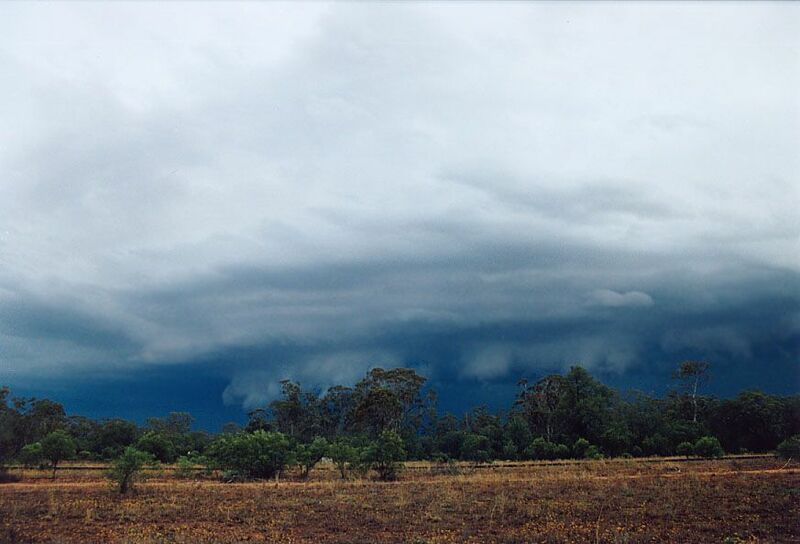 A low was set to become established in northwestern New South Wales. 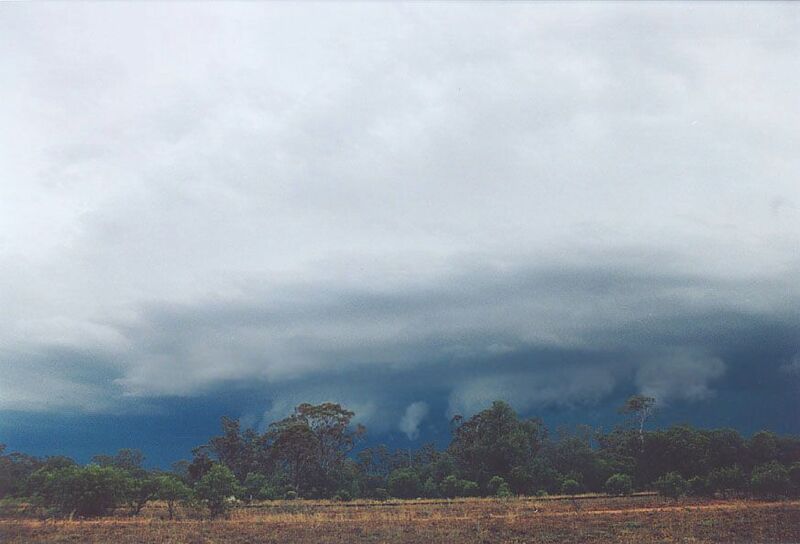 Moist air from the Coral Sea was already in place creating an increasingly unstable atmosphere across widespread regions of eastern and central New South Wales Monday afternoon. Surface Lifted Index values ranged as low -5 on Monday afternoon to -8 on Tuesday and Wednesday. Model CAPE values were expected to range up to 3000J/kg. And this was in the target region! Matt Piper, David Croan and I moved out to Dubbo on Monday evening whilst Jeff Brislane would head out the next day. Matt and I intercepted some storms with lightning east of Dubbo but David seem to be in the thick of the lightning nearer Bathurst and Orange. With tornadoes a certain chance, we could not sleep that night - besides we had to await David's arrival at 11pm. Malcolm Ninnes and his wife Sarah also stayed the night in Dubbo and planned to meet the next morning. Morning and the moment of truth had come: what would have been captured by the end of the day we had awaited for about a week. These were some of the thoughts that entered our minds. Breakfast could not have gone down so well with convection already developing to our west - just a teaser of things to come. Mal and Sarah joined us for the model check. Pheww!! Conditions were still looking awesome and the target still centered near Nyngan. Heading out to Nyngan had us more than occupied with a rain band and storms developing - some nice cloud to ground lightning. About midday, we arrived in Nyngan. It was a great lunch - we joked that it would have been our last supper - for the day that is:) Once the action began, storms would be onging into the night and the evening meal was not always guaranteed! The library check was very useful as the moisture haze reduced visibility. We remained there for at least half an hour. Bands of cumulus were already developing and then the lightning tracker revealed a couple of strikes. 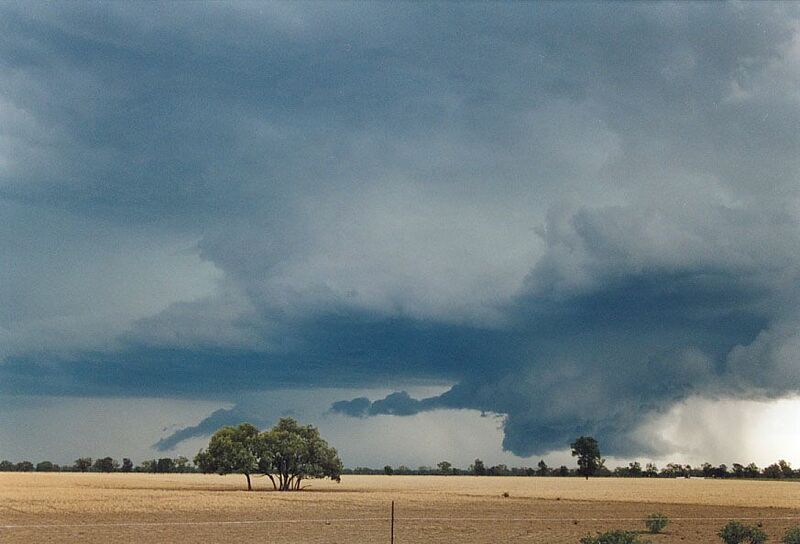 One cluster was near Cobar and one was near us!! Where? We raced out of the library and out of town for some observation. It was extremely humid with dew points hovering around 20C. Moderate northeast winds were still maintaining. Heading west, it wasn't long before we were in touch with the storm. It was a band streching northwest southeast. Nothing special. Lightning bolts pulsed ahead. Very low bases a good sign of things to come. But when we decided to hit a side road for a better vantage point, David shouted, "what's going on over there". This not so spectacular storm was undergoing explosive development and organising rapidly. And the time it took in doing so sent a shiver down my spine. Now this is what you mean but storms quickly becoming supercells. What? A wall cloud! We were shell shocked! Early afternoon and this storm was exploding faster than anything we had observed in this country. Inflow raced in towards the wall cloud. Where is a place to stop - damn trees blocking our view. Finally a break. 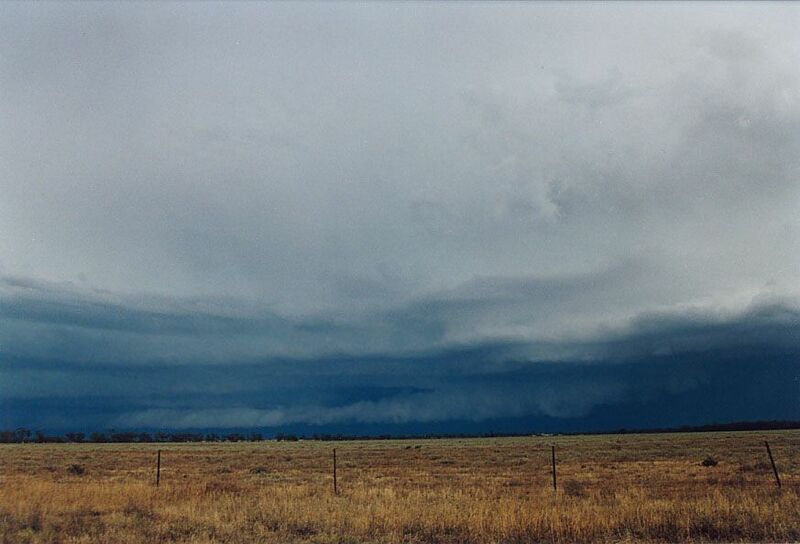 No time was wasted evacuating the vehicle - video cameras capturing the beautiful classic supercell structure. Video and photography could not do it justice - you had to be there in person! We were absolutely going nuts! I was so excited that the words coming out of my mouth almost did not make sense. 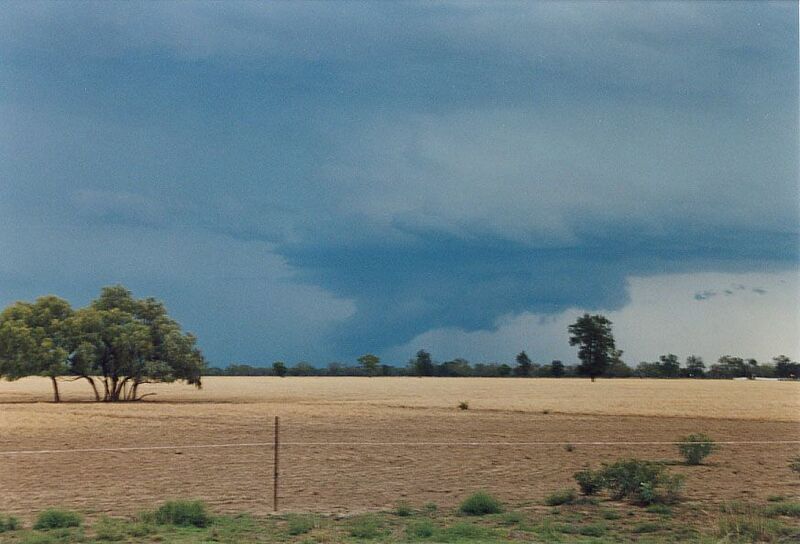 Where do you point: the bulging updraft, the inflow bands or the wall cloud. "I'm going to set up the tripod". David and Matt kept filming and who knows where Jeff and Mal had ended up. David yelled out "This is Great Plains stuff" almost swallowing his words out of excitement. Even Matt was going ballistic: I had not seen him like this since the tornadic storm in 2002! With video camera rolling timelapse, I thought I would take a few photographs of this beast. The anvil was powering backwards against the upper level jet. I became concerned that "we had to be careful of lightning". I guess nobody was in a rush to remain in the vehicle - not yet! Another tower had developed to its northwest dropping heavy rain. We hoped it would not interfer with this mesocyclone. And the rotation was increasing with the wrap-around coming through nicely. Inflow bands were curved and the winds suddenly increased. This seemed like a dream. We were in position to spot any funnels or even tornado. Slowly but surely, a shower of rain began to descend and cut through. You have got to be kidding! The storm was going to find it increasingly difficult to drop a visible tornado. It was transitioning into a HP supercell rotation though still evident. 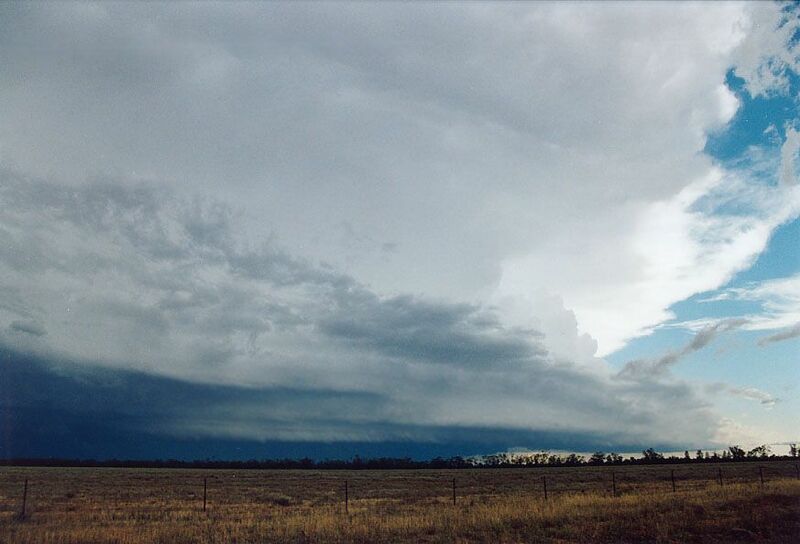 With this transition and the storm drifting further east, we headed towards Nyngan finally meeting up with the others. The HP supercell with inflow notch was still well organised and it seemed another updraft mesocyclone was possibly organising further back. But alas, it was downhill from here. The wall cloud became rainwrapped from view. With only one road south, it was too risky to head beyond this storm - very large hail a certainty. 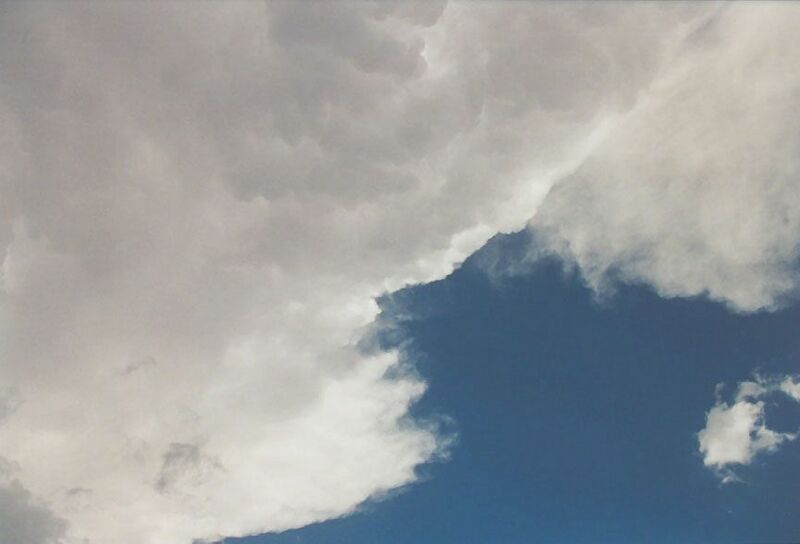 We did observe vigorous activity in the wall cloud region though it was not clear what was going on. But our focus was turning towards this right moving supercell approaching slowly from the north. This was the most incredibly structured low precipitation supercell we had observed with inflow tail and striated structure throughout the updraft! Inflow streamed in at the mid-levels. And it was spinning like a top!! The precipitation core dumped northeast of the storm just like your Tornado Alley right mover. LP supercell mean large hail. It was going to be tricky getting around this thing avoiding damage. But our worst fears were not realised. Back at Nyngan, it was time for a break and a reality check. Time for a reflection of what could have been and of course admiring the unusually shaped hailstones spawned by the LP. Hail up to 5cm had fallen in town from this not so ominous looking storm. So what next? 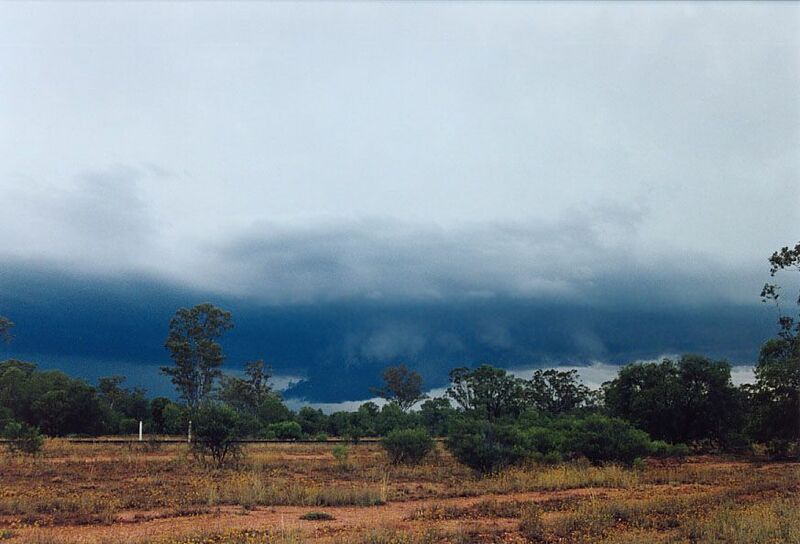 With yet another storm side-tracking Nyngan, we decided to move a little out of town. With storms to our east which definitely were supercells embedded in a band and definitely out of reach, we browsed across the clear air slot marking the rapid demarkation of the dryline and low to our northwest. There were storms to our west-northwest. One in particular had what seemmed to be crisp and powerful leaning updrafts. It was decided to investigate this storm. It was not long east of town though when an awesome structure began to evolve from the storm that had dominated northwest of this cell. This storm with a wrinkled crisp texture indicated powerful, explosive behaviour. Turning southwest on a side road provided an excellent viewing area for this storm. We were on awe! 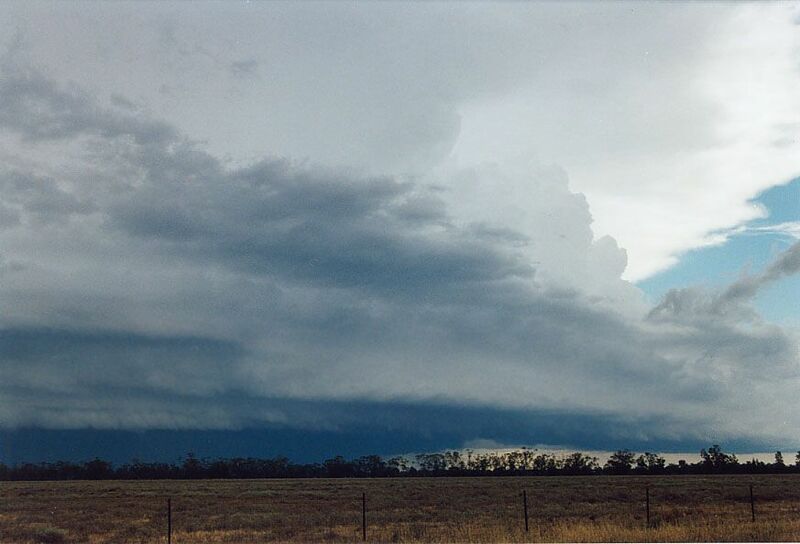 This beautiful clean high precipitation supercell was complete with striations! 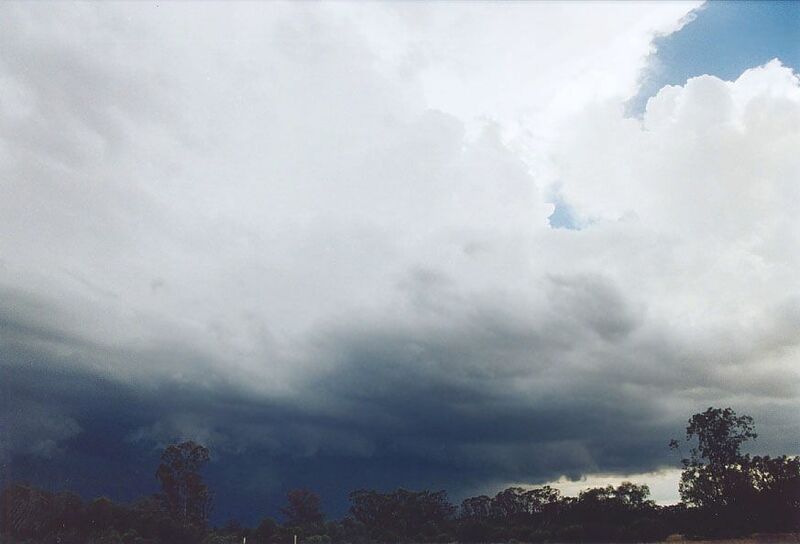 It was the most beautiful HP supercell I had seen in this country. This storm was dangerous with high winds and very large hail a certainty. Any vehicle that dared penetrate was certain to suffer fate. This giant beast was rotating and well organised. 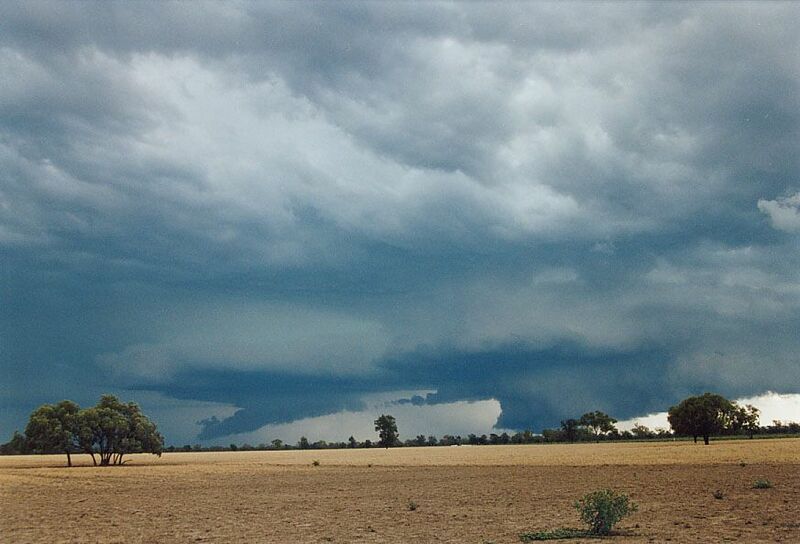 And once again, inflow streamed in from the northeast into the notch and wall cloud region. As the storm neared, a dark green tinge engulfed the horizon. As spectacular as it was, it demanded respect. One wrong decision could end up with injuries and severe damage. We needed to move soon but at the same were hypnotised by the approaching eerie darkness. Knowing that our vehicles were at risk, we finally made a hasty retreat. 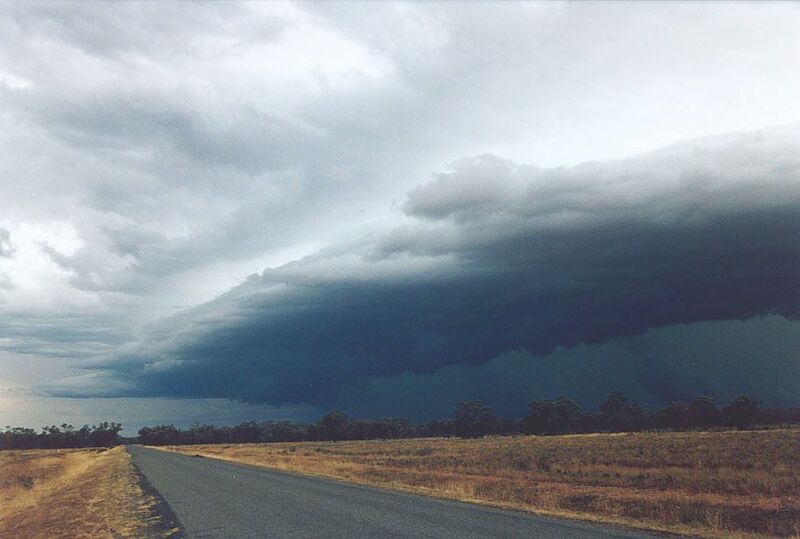 Heading back to Nyngan, the storm gradually transitioned into a scuptured shelf cloud appearance. The storm was in a weakening phase and outflow dominant. 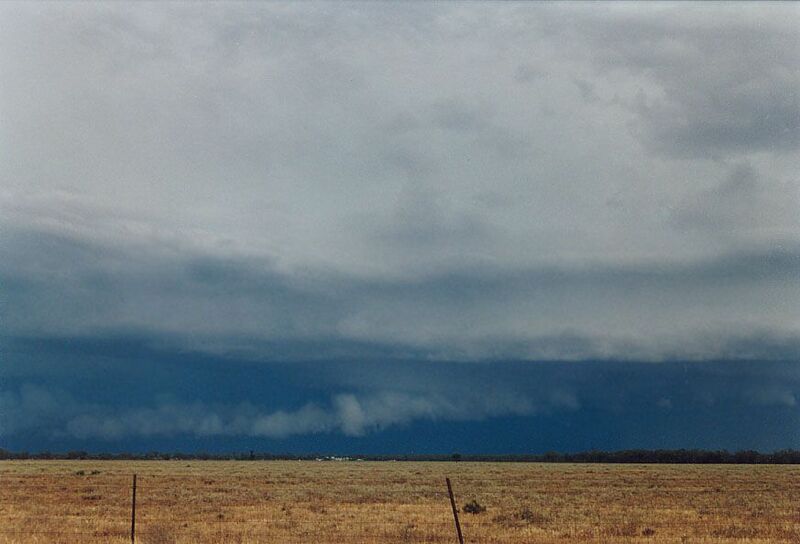 However, on the road south of Nyngan, the storm began to reorganise with stronger inflow. Occasional bolts pulsed ahead and through the inflow. We chased it east but the storm steered away from the road and was in a weakening phase. Satisfied with the day's catch, these hungry chasers needed to fill up their tank and find accommodation. 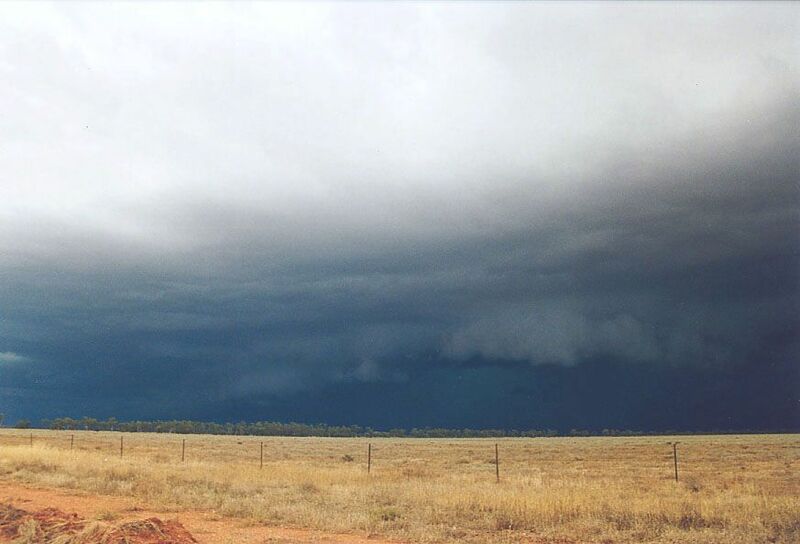 Three magnificent supercells covering all parts of the spectrum in this sparsely populated outback with limted road network was nothing short of a dream. And there was another long day ahead of us. As anticipated in such outbreaks, a mesoscale convective system developed during the night producing a decent lightning show. Model checks on the 8th December at Narromine was a little frustrating due to slow internet speed but our target was still north of Coonamble. The pattern was similar with slightly less instability though a weaker cap was a negative. 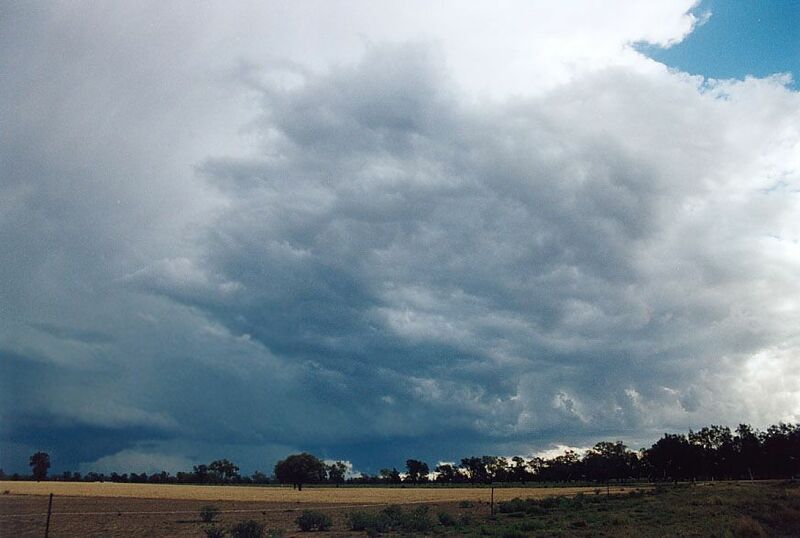 A sharp dryline was still in place with the axis of the rich moisture further north near Walgett. This meant there was a slight mismatch of the parameters but supercells and again tornadoes could not be ruled out. Brett and Willy arrived just in time for departure. Brett had also brought his son Ben along who was dying to see a storm. Aiming to meet Mal at Gilgandra, we welcomed the moderate to fresh northeasterly airflow. A clearing was in place further north based on the latest data so no time was wasted heading to Coonamble. 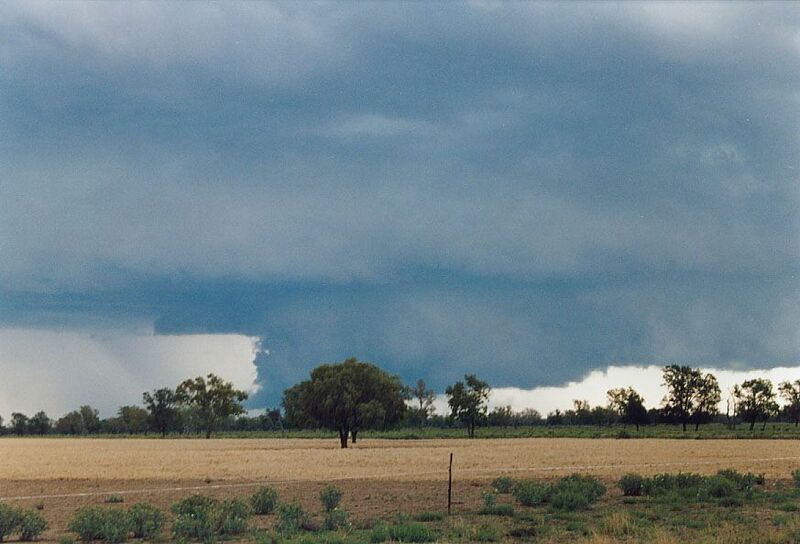 Large congestus had filled the sky already in the clearing near Coonamble though nothing was organised. It was aimed to have an updated check of the internet and some lunch there but alas, the whole town as we arrived was blacked out. No lunch - no internet! Darn. Stocking up with supplies we headed out of town for observations. Apart from the obvious widespread cumulus fields, I personally was looking for something more substantial and some dryline magic. Cirrus had begun to invade the skies that was reminiscent of anvil. A check of radio static revealed more distant lightning than was possible from what was around us. "Time to head north. Well we are heading north". Jeff indicated he would head north as well soon. The trees once again spoiled our view until we neared Walgett. We admired the storm well to our southwest (Michael Thompson was having fun with this storm) and imagined our updrafts would be similar! Based on its original motion, positioning was crucial and lead us to about 30km south of Walgett. The anvil had spread well to the southeast and a reasonable structure existed to our west although the storm seemed to be struggling going through strong updraft phases. Outflow probably from the rear flank downdraft spread north. Another updraft rapdily developed that thrived on the moist northerly inflow. It was interesting that the storm which we had raced to remain in contention was no longer in a hurry - it seemed to be anchored on the dryline. Scud streamed into the base but the storm exhibited no intention of becoming outflow dominant. Time to move up close and personal. 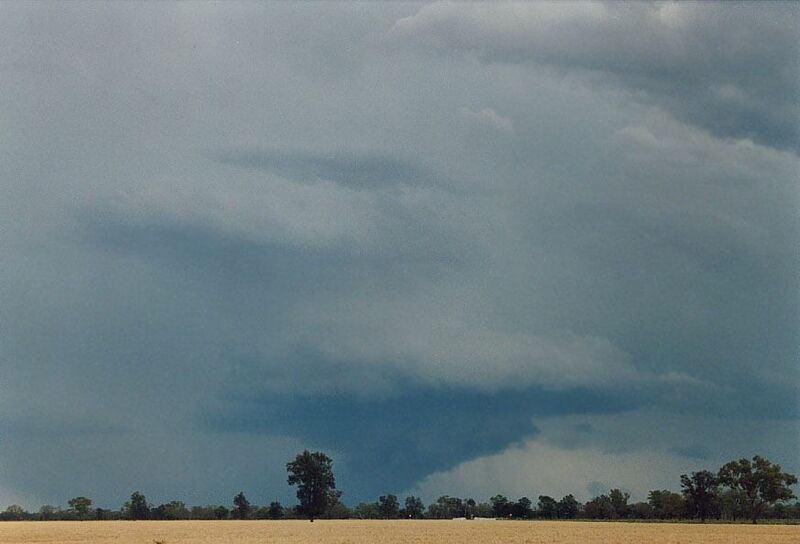 A wall cloud developed below the southern updraft - the storm now in a classic supercell phase. Lightning activity increased. Buckle your seat belts folks this storm was set for some dryline magic! With improved contrast in close proximity to the storm and parked near an open field, we watched the spectacle unfold. Inflow into the wall cloud streamed in from the southeast. Northeast winds freshened - this storm tapping any available mositure. And why wouldn't it. 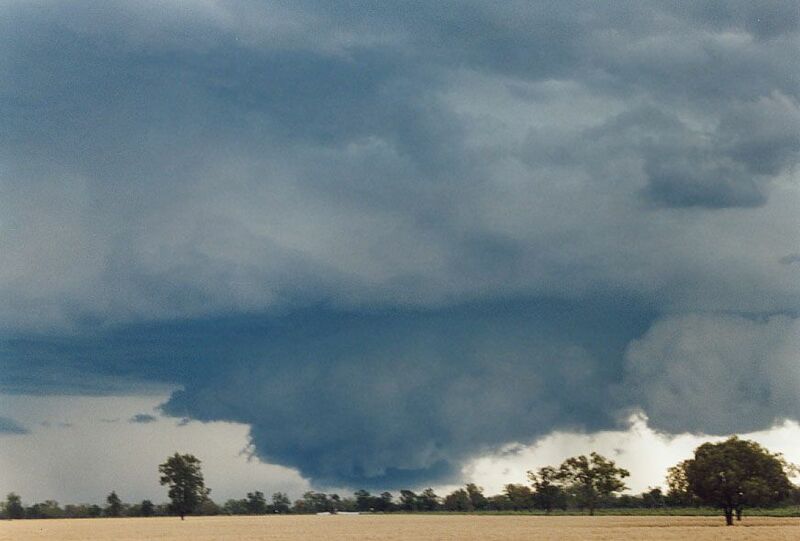 Astonishingly, a second wall cloud developed from the second updraft and rapidly organised. Two wall clouds side by side! What more could you want - two wall clouds within close proximity - low bases - the threat of two tornadoes!! Well initially the first wall cloud dominated with slight rotation observed then the second wall cloud began to rotate also as the first entered hybernation. And the contrast simply got better. The green tinge just topped it off!! I could stand there and watch it for hours! It seemed a timeless period of time to be in a peaceful rural setting isolated from the hussle of city life staring at twin adjacent wall clouds from the same storm sharing one anvil - the wall clouds shielding from view the dryline air. The second wall cloud had slowly drifted southeast but now was making a move. Outflow most likely from the reaf flank downdraft pushed northeast aiding to maximise the rotation. It was chaostic under the wall cloud at this stage as if something was struggling for dominance. Well once again it was the outflow that won slotting its way through. 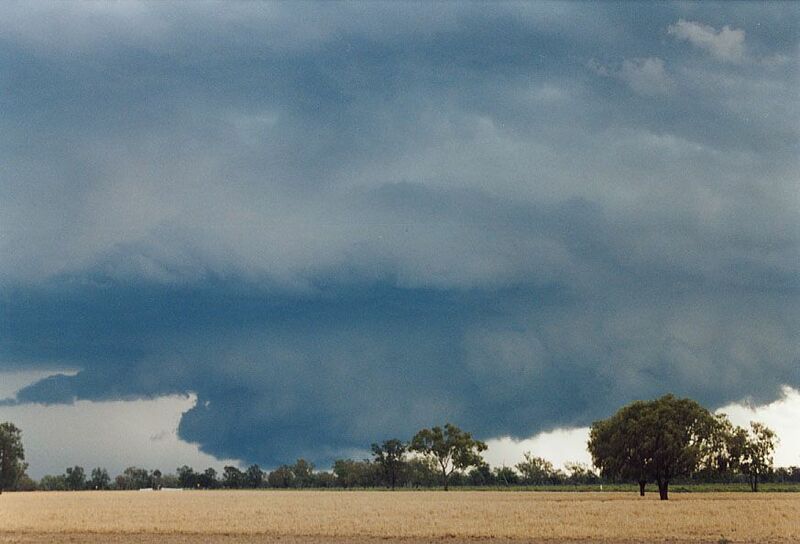 Once again the possibility of seeing an Australian tornado up close and personal diminshed. Repositioning further southwest showed another strengthening phase of the first wall cloud but alas, the outflow dominance was simply ovserwhelming. It would have been ideal to remain ahead of this awesome rainfree cloud base but we risked getting stuck on this dry weather road with rain threatening. Finally nearing the main road, another supercell had approached with a wall cloud though higher based. This storm rapidly entered the outflow dominant stage. We paralleled the storm for a while and then it passed over us as an HP supercell. Lightning observed in the core was reasonably frequent though no hail was reported except further east. Lightning may have been erratic but some were captured on video. This I must say was one of the most unusual supercells we had ever chased. The behaviour of the wall clouds deserve further investigation of other similar cases. And to think the storms remained anchored along the dryline with low bases - almost an unheard scenario in Australian storm chasing. It was surprising that tornadoes were not reported up to the time of this article although a silo dumped onto the side of the road with an undamaged fence should be further investigated. This occurred most likely from the first supercell on the 7th December discussed in this article above. But we were more than satidfied - chasing several supercells on two consecutive days is more than once could hope for in any event.